Richard P. Feynman is one of the most venerated American physicists of the late 20th century. While physics was his main claim to fame -and his list of accomplishments were many- he was also a gifted and adventurous writer, bringing the world of mathematics to everyday people in an accessible fashion. 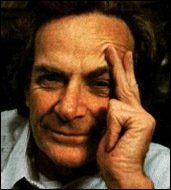 Born in 1918, Feynman grew up in New York, and received a Ph.D. from Princeton University. After working on the infamous Manhattan project during World War II, he became a professor at the California Institute of Technology. Here he came to be known as "The Great Explainer" thanks to his uncanny ability to make physics understandable. Feynman did most of his best work during his tenure as a professor at Caltech, earning awards and general regard as was one of the greatest teachers of physics ever. Luckily for us, Feynman's lectures were recorded and have found their way to the ears of many students eager to learn physics from a master teacher. To get a good introduction to Richard Feynman, we first suggest you listen to Surely You’re Joking, Mr. Feynman! an autobiography that details Feynman's many achievements, social run-ins and adventures in the world of modern science. This audio book is a must as an introduction to Feynman's way of life and world view. Next there's The Pleasure of Finding Things Out, a selection of talks, interviews, essays, and other examples of Feynman's wit and intelligence. Finally there's the first entry in The Very Best of the Feynman Lectures ; culled from his massive 3 volume collection that features the recorded lectures for which Feynman became famous as a teacher. Here you will see why Feynman drew inspiration from his students, and in the end why his greatest achievement may have been in defining the art of teaching itself. Whether you are a student of physics, interested in 20th Century luminaries, or simply wish to laugh while you learn, you can't go wrong with the lectures and audio books collected for your perusal here. Enjoy! "The more one reads of Feynman, the more one falls in love with his refreshingly enthusiastic view of the world." With genius, passion, and unmatched flair, this one-volume "greatest hits" of the Feynman lectures places you in the classroom of one of the twentieth century's most brilliant teachers.